#11-13 Original antique pool table rail bolts. Not reproductions. 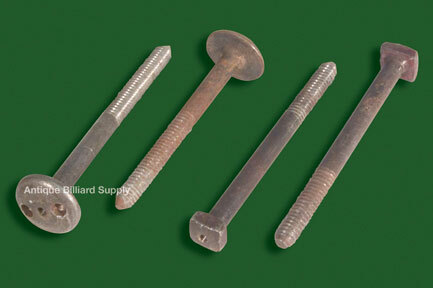 Various lengths, used to attach table rails to slate. Wide variety of antique styles and thread patterns. Square heads or round heads, some drilled for rosettes. Available as singles, or in matching sets. Round-head 3.75" length $14 each, others higher.